The Bio-Rad ddSEQ system works in combination with the Illumina SureCell WTA 3' Library Prep Kit. The GSC does not stock any of the ddSEQ consumables. 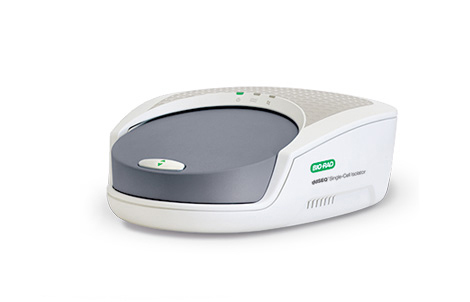 The user will need to contact the GSC prior to use of the ddSEQ system so we have suitable time to order the appropriate quantity of required reagents for the experiment. Users can also purchase ddSEQ consumables from Illumina. Users are required to provide at least 6-10ul of dissociated cells at 2,500 cells/ul in PBS+0.1%BSA Buffer - prepared as described on pages 5-10 of the SureCell WTA 3' Library Kit guide. Users are required to count and dilute their cells to ensure they are at the appropriate concentration and viability. The cell suspension is stable for 1 hour on ice. Users must pre-reserve the day they wish to use the ddSEQ by emailing the GSC staff at gsc@ku.edu. We recommend planning experiments in sets of 8 samples. The ddSEQ system is avaliable for user operation after initial training. Alternativley, the cell suspension can be dropped off and library preparation can be performed by a GSC employee for $3,000 per 8 sample set - includes all consumables. Please email us at gsc@ku.edu for training or to reserve a day to drop of samples for ddSEQ library preparation.